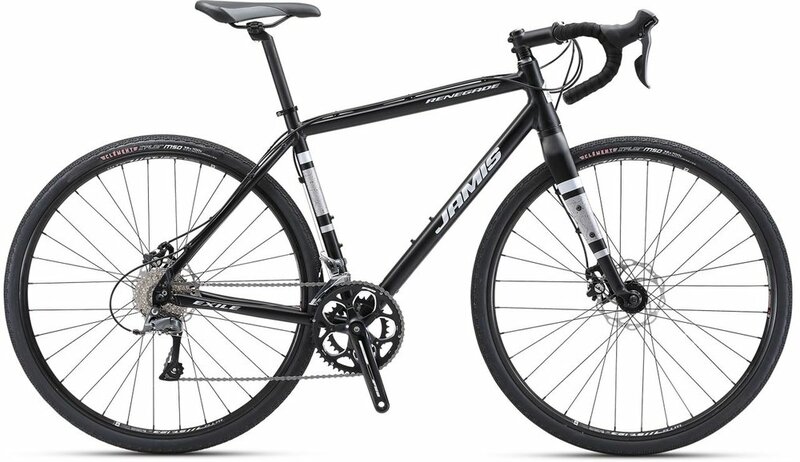 Jamis Renegade adventure bikes are ready for any road - or beyond road - surface. 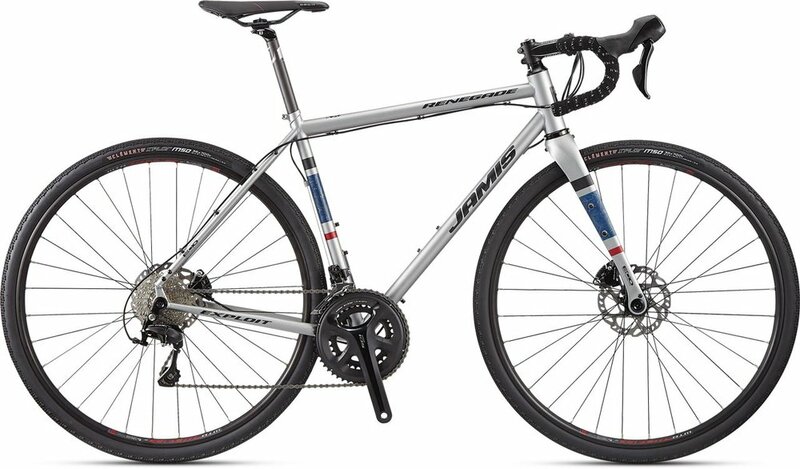 Whether you call them gravel bikes, endurance bikes, beyond road or adventure bikes, this truly is a family of bikes ready for anything: the Jamis Renegade series. The long and tall endurance geometry is designed specifically to ride comfortably all day on the road or in harsh conditions off-road, while all-weather disc brakes, sturdy thru-axles, three water-bottle mounts, tubeless-ready rims and clearance for wide 700 x 42c or 650b x 47c tires (700 x 40c on carbon bikes) give these bikes extreme versatility. No matter which Renegade you choose, from the smooth, high-performance carbon fiber Elite and Expert models to the supple steel of the Escapade, Exploit and Expat, or the responsive aluminum Explore and Exile, you can feel confident knowing you can go just about anywhere. All you need is the desire to push, pedal and explore. We are an authorized Jamis Dealer and offer the opportunity to test ride renegade series bikes at our shop. 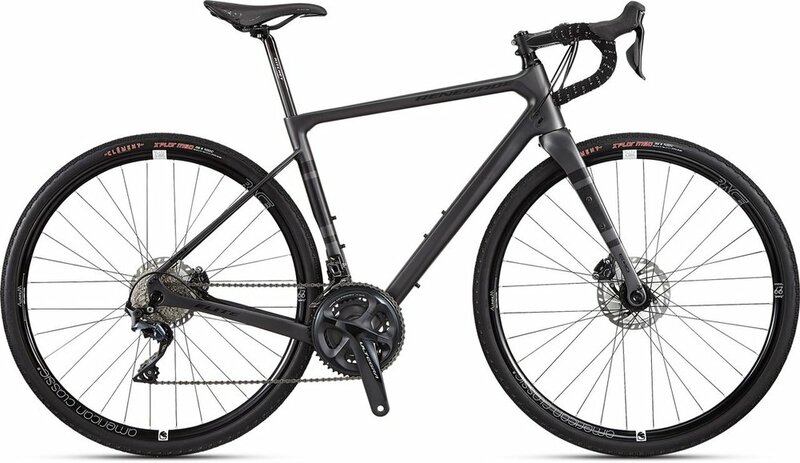 The top of the line Jamis Renegade Elite is built around a high-performance Omniad M30 carbon fiber frame with Jamis' distinctive adventure geometry, offering extreme responsiveness and a smooth ride on any road (or dirt, or gravel) surface. Fully equipped with Shimano Ultegra 22-speed drivetrain, Shimano BR-R8070 hydraulic disc brakes, American Classic tubeless-ready wheels, and Ritchey bar, stem and seatpost. At a mere 18 lbs. it all adds up to the ultimate adventure bike. In sizes 48-61cm. 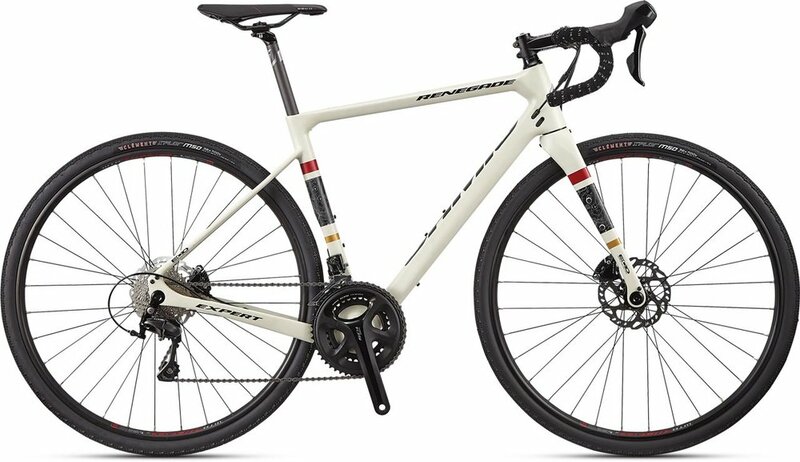 With a Dyad Plus carbon fiber frame sporting the same adventure/endurance geometry and handling as the Elite, the Renegade Expert boasts a Shimano 105 22-speed drivetrain, Shimano hydraulic disc brakes, WTB i23 tubeless-ready rims and much more. As with every Jamis Renegade, this bike is ready to be set up for any use with its hidden fender/rack eyelets and clearance for up to 40mm wide tires. Sizes 48-61cm. The Renegade Escapade showcases the same geometry as the Elite, constructed in classic lightweight Reynolds 631 steel with Jamis' ECO carbon fork. Fully equipped with Shimano Ultegra 22-speed drivetrain, Shimano BR-R8070 hydraulic disc brakes, WTB i23 tubeless-ready wheels, Ritchey bar & stem, and Fizik Alliante saddle. Tire clearance permits up to a 700 x 42c tire, or outfit the bike with 650b wheels and 47c tires for maximum comfort and grip. In sizes 48-61cm. Sizes 44 & 48 come with 650b wheels (36c tires) standard. The Renegade Exploit is the Reynolds 631 steel version of the Expert, with the same Jamis ECO carbon fork. Fully equipped with a Shimano 105 22-speed drivetrain, Shimano BR-R5505 hydraulic disc brakes, WTB i23 tubeless-ready wheels, and Ritchey handlebar & stem. Tire clearance permits up to a 700 x 42c tire, or outfit the bike with 650b wheels and 47c tires for maximum comfort and grip. In sizes 48-61cm. Sizes 44 & 48 come with 650b wheels (36c tires) standard. The Renegade Expat sports a supple, responsive Reynolds 520 steel frame paired with Jamis' ECO carbon fork. Fully equipped with a Shimano Tiagra 20-speed drivetrain, TRP mechanical disc brakes, WTB i23 tubeless-ready wheels, and Ritchey handlebar & stem. Tire clearance permits up to a 700 x 42c tire, or outfit the bike with 650b wheels and 47c tires for maximum comfort and grip. In sizes 48-61cm. Sizes 44 & 48 come with 650b wheels (36c tires) standard. The Renegade Explore is built around a light, stiff 6061 aluminum frame paired with Jamis' ECO carbon fork. Rapid, precise shifting from the Shimano Sora 18-speed drivetrain and confident braking from the Tektro mechanical disc brakes have this bike performing alongside bikes at twice this price. Wheels are WTB i23 tubeless-compatible, and the handlebar & stem are from Ritchey. Tire clearance permits up to a 700 x 42c tire, or outfit the bike with 650b wheels and 47c tires for maximum comfort and grip. In sizes 48-61cm. Sizes 44 & 48 come with 650b wheels (36c tires) standard. The Renegade Exile is built around a light, stiff 6061 aluminum frame and fork. The Shimano Claris 16-speed drivetrain shifts crisply through the gears while the Tektro mechanical disc brakes provide confident braking. Wheels are WTB i23 tubeless-compatible, with puncture-resistant Clement tires. Tire clearance permits up to a 700 x 42c tire, or outfit the bike with 650b wheels and 47c tires for maximum comfort and grip. In sizes 48-61cm. Sizes 44 & 48 come with 650b wheels (36c tires) standard.